251002 (BW T0114023082) This is an upgraded turbocharger for the 2013-2016 Ford F150 3.5L Ecoboost Truck: Left Side, without CRV, this turbo replaces 5303 970 0276, 5303 970 0469. It is a requirement to upgrade both turbochargers at the same time, otherwise there will be an imbalance in the system. Buy part number 251003 at the same time. With proper tuning, these turbochargers can bring the engine to a power output beyond that of the Raptor Ecoboost. 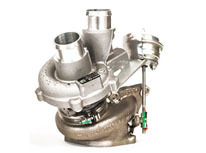 These are BorgWarner turbochargers, they are new, not modified OEM units, and there is no core charge.